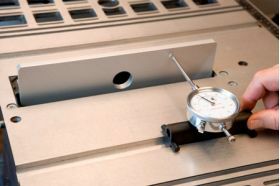 The SuperBarTM with its on-board precision Dial Indicator will super tune your table saw within thousandths of an inch in minutes. * Align the saw blade parallel to the miter slot * Align the fence parallel to the miter slot * Square the miter guage to the saw blade * Check run out on arbor shaft and mounting flange * Check run out on routers, drill press, shapers, etcThe SuperBar fits all standard 3/4" x 3/8" miter slots - as well as Sears (.740 slot). The SuperBar works with MasterPlateTM - a specially designed alignment plate. The MasterPlate is precision ground 6" x 10" x 1/4" thick aluminum plate with 5/8" and 1" diameter mounting holes. Substitute the MasterPlate for your saw blade to tune up, align and calibrate your table saw - get the maximum performance from your saw!